Book 13/25 in the 2011 Reading Challenge. Date completed: May 24, 2011. My friend and I were out together a couple of weekends ago trying to come up with something to do - play the slot machines for a while, have a couple of drinks or maybe catch a movie before we headed back home for the night. We went by the movie theater on base to see what was playing, but found it empty. Ridiculous for a Saturday night, if you ask me, but we stood out front and looked at the schedule and the movie posters featured outside before we headed down to the bowling alley. Advertised as "Coming soon" was a movie called Water for Elephants. I squinted at the poster in the dim lighting and said, "What is THAT about???" My friend said, "Oh, I don't know. It has Reese Witherspoon and that "Twilight" boy in it." Huh. I live under a rock as far as newly released movies go and I really have very little desire to see anything with the "Twilight boy" in it anyways, so whatever. We bought a couple of drinks from the soda machine and moved on. A few days later I logged into the Reader Store and saw the book on the front page, advertised as a bestseller. Ok. So I bought it. It was very impulsive but it was while I was reading Winter's Bone, so I needed something to look forward to. I bought a lot of books while I was reading Winter's Bone to try and motivate myself through it. Then I forgot about it because I got distracted by Tina Fey. 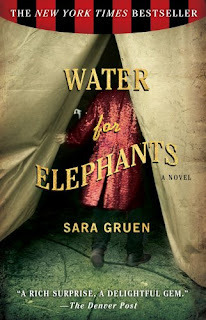 But while I was reading that, the same friend I was with outside the theater that night told me she had bought and started reading Water for Elephants and told me that it was so far really good and I should start it next. So I did. And (this is the same friend that suggested I read Running With Scissors) of course, my friend was right. It was a great read. I finished this book pretty quickly, and was completely captivated by the romance, the era, the circus, the animals, the drama, and the adventure. I feel like this book maybe took a little bit from Nicholas Sparks' The Notebook as it begins and ends with an elderly Jacob Jankowski, a nursing home resident, reflecting on his past. His story is nothing short of riveting. I've read mixed reviews on the book - some people suggest it was overrated, some people loved it. I loved it and gave it a five star rating. I thought the story was absolutely beautifully done and I thought that the ending was completely appropriate and not devastating like some love stories tend to be (coughTheNotebookcough). Now if only our on-base theater would play this movie sometime soon - I'm of course dying to see it, and I think I'm even willing to look past Robert Pattinson's teeny-boppin' self. I saw this book a while ago on goodreads and kept contemplating whether to add it on my list. Then a month later found out that they were filming the movie. I figured that was why it was getting so much hype online but added it on my list anyways. I am a sucker for books turned into movies. I always want to read the book before watching the movie... not that I want to watch this movie. I will have to give in and give it a try now that I know someone who has read it. The Hungry Little Bento... and other stories.